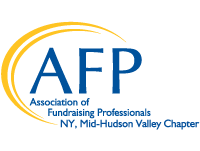 To advance our profession and grow chapter membership, the Mid-Hudson Valley Chapter is offering $1,000 in scholarships for the 2018-2019 year to help qualified individuals and organizations attain AFP membership. This year, scholarships are available for New Professional Membership and Small Nonprofit Organizations. The deadline for scholarship applications is rolling. Please contact mhvafp@gmail.com with any questions.